Sunblock - When the skin needs to be PROTECTED FROM THE SUN, mix one bottle of alcohol based gel sunscreen (ie. #30 Shade sunscreen) in a 22 oz. trigger spray bottle with REEL Developer or 99% Isopropyl alcohol. Fill to fill line. Spray over skin, including REEL tattoos and REEL Body Art Inks. DO NOT SATURATE. The REEL COLOR WHEEL PALETTE is a paint box with all the REEL spectrum colors including aged tattoo linear and red neutralizer. 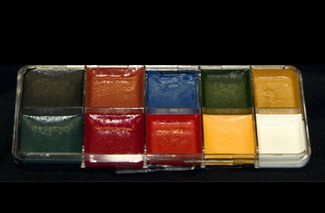 You can make virtually any color either fleshtones or vivid spectrum colors.